This entry was posted in Uncategorized on January 31, 2018 by Elizabeth Cardamone. Prospective job seekers may also apply in person at Empower’s administrative offices, located at 9812 Lockport Rd., Niagara Falls, NY 14304 or apply online at: http://empower-wny.org/about/careers/. Direct Support Professionals (DSPs) are dedicated to helping individuals with developmental disabilities live safe, fulfilling lives. Individuals with developmental disabilities are reliant on DSPs for basic care, getting out into the community and ensuring their choices and needs are met. It is hands on and rewarding work in which DSPs and the people they serve get to know one another well, and become close. This entry was posted in Uncategorized on January 8, 2018 by Elizabeth Cardamone. This entry was posted in Uncategorized on November 20, 2017 by Elizabeth Cardamone. Mapleton residents got out this summer and fall to enjoy local attractions, including Maid of the Mist and a field of sunflowers. 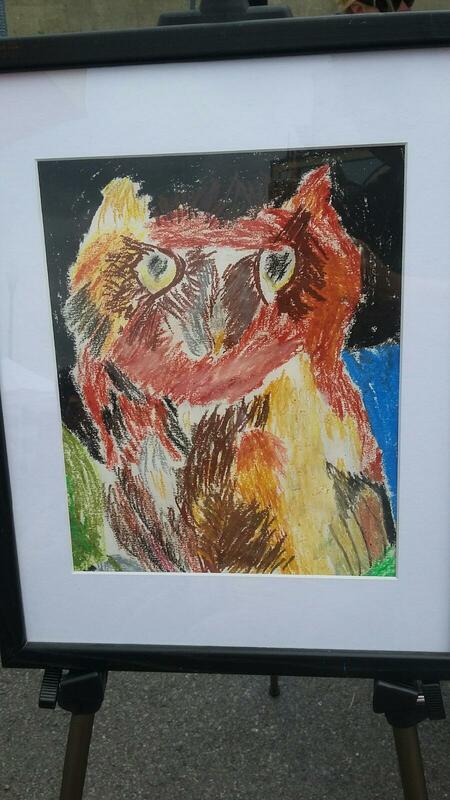 Lockport ICF resident Kerry Warner made this beautiful piece of art entitled “Owl Pastel” which was proudly displayed in the storefront windows of many Main St. shops in Lockport. Congratulations, Kerry! On Saturday, October 14, Community Housing held their annual Halloween Spooktacular party at the Volare Lodge. The event was well attended by residents and by members of Job Training and Day Program’s Family Support Group. This entry was posted in Uncategorized on November 13, 2017 by Elizabeth Cardamone. who need assistance with personal care and daily activities. Participants receive individualized care, light exercise, assistance with personal care, socialization, activities that promote independence and feelings of self-worth, and morning and afternoon snacks and lunch. The program offers respite to family caregivers, allowing them to work, run errands or take a break from caregiving duties. In addition, a new caregiver support group will enable family caregivers to meet, share experiences, ask questions and receive support. Empower for Elders is located at 8962 Porter Rd (Wayside Nursery Plaza) in the Town of Niagara. It is open on Mondays and Wednesdays from 10 am to 2 pm, and Tuesdays, Thursdays and Fridays from 8 am to 5 pm. Spots are still available! For more information or to set up a tour, please contact Karen Smith at (716) 297-0798 x163 or (716) 371-0728 or ksmith@empower-wny.org. On Sunday, August 27, the Masons FC held their annual Dice Run, an eighty mile motorcycle ride throughout Niagara County that concluded at Lewiston Firehall #2 with a classic car show, spaghetti dinner and basket auction. The Masons FC selected Empower for Elders as the charity that would receive the event proceeds. 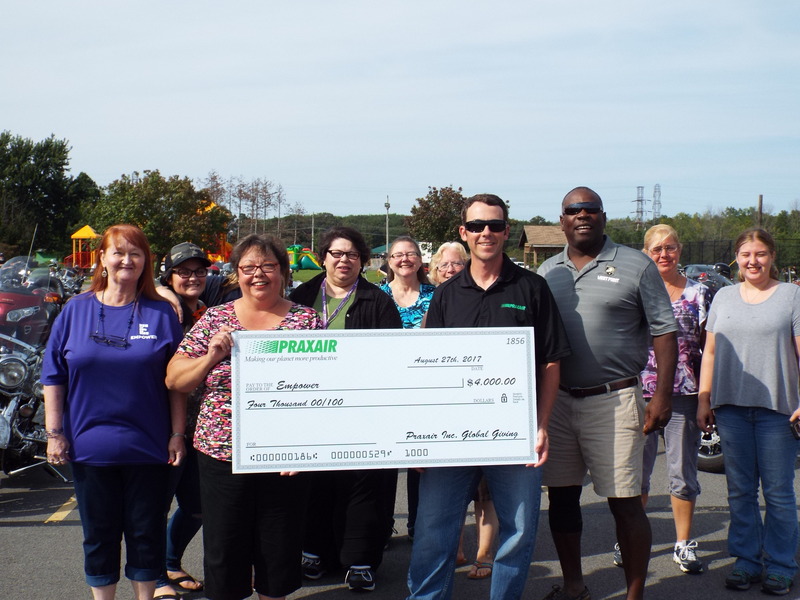 In addition, Praxair, a company that produces gases with an office in Tonawanda, NY, presented Empower for Elders with a $4,000 check during the Dice Run. 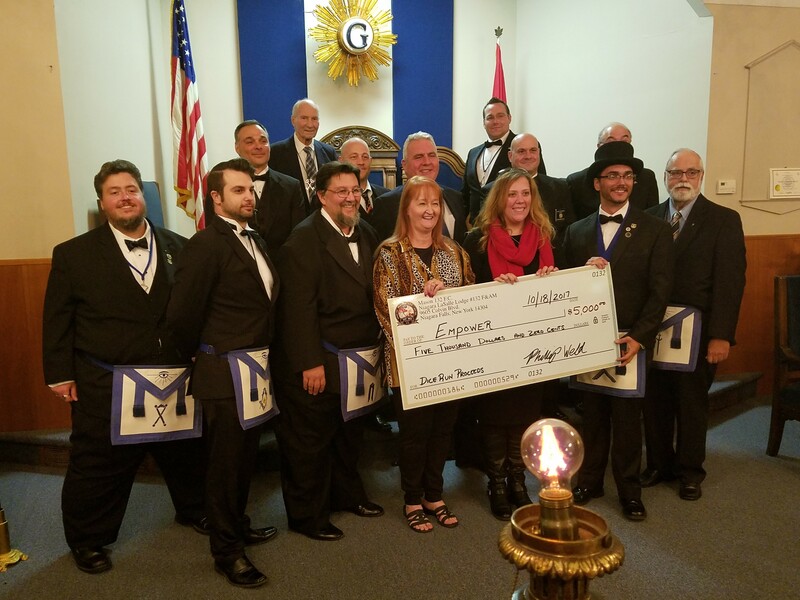 On Wednesday, October 12, the Masons FC held their annual gala, at which they presented Empower Director of Community Health Programs Karen Smith with a $5,000 check, which included all Dice Run proceeds. A huge thank you to Sam and Jeannette Archie, the members of the Masons FC and Praxair for their generous support totaling $9,000 which will be used to offset Empower for Elders start-up costs! Empower is delighted to bring the Kids’ Music Round program to Niagara County. Classes are open to children of all abilities and backgrounds. Classes are 45 minutes each week for a 10-week semester. Kids’ Music Round is a singing, laughing, giggling, jiggling, clapping, dancing, bouncing, fun-filled, award-winning music and movement experience for infants and young children. With the KMR children’s music program, parents can help bring out a child’s natural curiosity about music in a playful, encouraging class environment. Classes are held at 8962 Porter Rd. in the Town of Niagara on Tuesday evenings and Saturday mornings. Fees are $149 for the first child, $89 for the second sibling and subsequent siblings and infant siblings are free. For more information or to enroll in the next session which begins in January, please visit our website at http://empower-wny.org/services/childrens-academy/kids-musicround-class/. Day Program Renamed Joseph O. Mineo Day Center On Wednesday, October 5, Empower staff, Board members and the Mineo family gathered to celebrate the renaming of the Day Program building as the Joseph O. Mineo Day Center. Mr. Mineo worked for Empower for 47 years, 45 of which were as the agency’s chief executive officer. Under his leadership, Empower established most of the programs and services that exist today. The Joseph O. Mineo Day Center is where people with intellectual or developmental disabilities can participate in daytime recreation activities and socialize with others. It is located at 7425 Buffalo Ave. in the City of Niagara Falls. Congratulations to Joe on this well-deserved honor and a huge thank you to him for his longtime service. The best part about Halloween is seeing the kids in their costumes and hearing them say “trick or treat!” Here at Empower, we are lucky enough to have a preschool on site and to get to see students parade around the building all dressed up in their costumes. They are accompanied by parents, younger siblings and teachers who also dress up. It is truly a treat to hand out treats to these amazing kiddos. Also, a huge thank you to Children’s Academy teachers and staff for once again creating the haunted hallway! It looked amazing. Ms. Shaila is really good at packing multiple disciplines into one lesson and engaging students so that they don’t even realize they are learning! That was certainly the case this month. Students learned about the fall harvests that are occurring on farms all around them, including equipment and animals that are an important part of this process. They colored in pictures of farm animals and equipment and used soft cotton balls and string, which engaged their senses and provided an additional layer of learning. Ms. Shaila also taught students about testing hypotheses and measurement by having the children guess how far a pumpkin would roll and measuring this distance. Ms. Shaila then rolled the pumpkin and measured the distance again to see how close students’ predictions were. Students had a ball doing this activity. Families of Children’s Academy students had a chance to come in, meet teachers and staff, get progress reports and see first hand some of the projects their children have been working on. It was a wonderful and well attended event. Since opening in 1961, the Job Training and Day Programs division has helped thousands of people with disabilities identify and express their unique abilities. The program grew from donated space to two large facilities (30th St. and MacKenna Ave.) where people with a variety of disabilities worked doing contracted work for local companies. When manufacturing companies left Niagara Falls, there was less contracted work to be had. The division was challenged to expand its network of job sources to ensure workers continued to earn a wage and develop job skills. In addition, laws became increasingly restrictive which resulted in: referral source decreases, fewer participants who met the qualifications to be supported, limitations on services that could be provided and sites being considered too segregated and therefore in violation with participants’ rights. With the future of the division, once the agency’s highest revenue-producer, in jeopardy, Empower sprang into action, developing a plan for transitioning job training services to comply with these new legislative realities. Empower was the first disability provider in New York State to submit its plan, and set an ambitious goal of it being complete by the end of 2017, three years ahead of the state’s deadline. In fact, many of plan’s components have already been put into place such as Empties for Empower which is the agency’s first integrated job training site. Although it has only been open for eighteen months, Empties for Empower has become an indelible part of the culture of both the agency and its surrounding community. Customers say that before coming to Empties, they had never spoken to people with disabilities, and that they come back because of how helpful and friendly workers are. Many more people with disabilities ask to work at Empties to earn a wage and gain the skills needed to get jobs in the community. Empties has had a snowball effect of goodness that has surpassed everyone’s expectations. 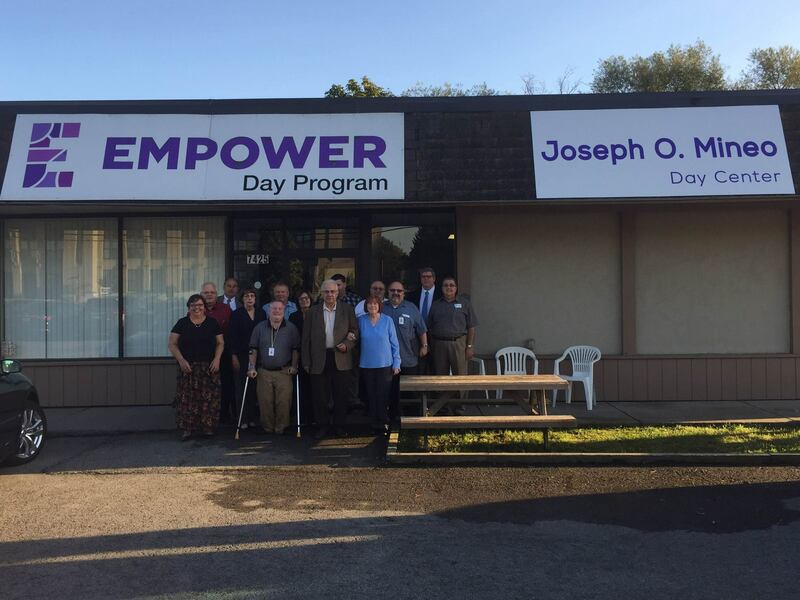 It has been so successful that Empower will soon open another redemption center on Niagara Falls Boulevard in the Town of Wheatfield. All three of the award nominations submitted by Empower were honored at the annual Cerebral Palsy Associations of New York State conference held in Saratoga Springs, NY. Cerebral Palsy Associations of New York State is a broad-based, multi-service organization encompassing 24 Affiliates and 18,000 employees providing services and programs for more than 100,000 individuals with cerebral palsy and developmental disabilities, as well as resources for families. Kim Kiely, Director of Job Training and Day Programs, received the Natalie Rogers Employee of the Year Award, for her leadership in transforming Empower’s sheltered workshops to integrated sites for people with disabilities. Charles Dieteman, a student at Lewiston-Porter High School who has cerebral palsy, received the Anthony J. Koenig Volunteer Award for educating his peers about cerebral palsy and conducting annual fundraisers, which have raised $4,000 that Charles then donated to Empower. The Spectrum Theater Program was among three programs that were recognized as being innovative and that were invited to give presentations at the conference. Autism services coordinator Robin Stevens and acting instructor Brianna Lanoye demonstrated how acting exercises and performing improve social skills in kids with autism. In addition, New York State Senator Robert G. Ortt was recognized as the Legislator of the Year Award. As chair of the Mental Health and Developmental Disabilities Committee, Senator Ortt is a strong advocate for people with disabilities. In particular, he has worked to secure funding to relieve the staffing shortage in the disability field. Empower’s 2017 Annual Appeal kicked off with 3,000 appeal letters sent to current and prospective donors. We are hoping to shatter last year’s $7,000 giving total. Donations will support programs like Empower for Elders that help people with and without disabilities to live their best lives. To make a donation, click here or contact us at (716) 297-0798 x 173 or ecardamone@empower-wny.org. Marshaun Walton, 2017 Inspiring Individual of the Year Award recipient, for his courage and determination shown while achieving his goal of greater independence through getting a job in the community and moving into his own apartment. John R. Drexelius, 2017 Dr. Salvatore M. Passanese Leadership Awardee, for developing a voice for people with developmental disabilities in Albany through his work as General Counsel to the DDAWNY Government Affairs Committee and through the #bfair2directcare initiative. KeyBank and KeyBank Foundation, 2017 Faith Funder Awardees, for being Empower’s steadfast financial partner all these years, including capital support, event sponsorships and investment in programs like the $24,719 grant received in 2017 to help start a scanning and shredding service. Fashion Outlets of Niagara Falls, USA, 2017 Priceless Partner Awardee, for being an excellent charitable partner and for collecting bottles in receptacles set up around their food court and donating them to Empties for Empower with the goal of donating a million cans! Wegmans, 2017 Employer of the Year, for hiring many people with developmental disabilities through Empower since 2000 and maintaining ongoing communication with Empower’s Job Placement division to ensure workers continue to grow in their positions. Every year in September, Empower hosts a dinner where staff and people served are recognized for excellence and loyalty. Each month, the Job Training and Day Programs division spotlights a person who receives services for their dedication and hard work. These twelve individuals and their families are recognized at the dinner and received a plaque. Division directors presented service awards to their staff who have worked for Empower for five, ten, fifteen, twenty, twenty-five and thirty years. This year, thirty-five staff were honored. It was heart-warming to hear Bill, Sherri and Kim relate personal accounts and stories of exemplary service as each honoree was introduced. These folks are the very best of Empower, going above and beyond to ensure the people we serve are empowered to live their very best lives. Sharon Walters received the Person of the Year Award for her hard work and personal growth. 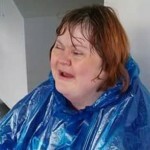 Sharon has a great sense of self and is very caring. The Community Housing division presented Deanna King with the George Optical Award for her leadership as an IRA Manager and for her incredible commitment to each person she serves. Empower Board member and Past Present Bob DiFrancesco presented the first annual DiFrancesco Award to Daniel Kneeple for mentoring new staff and ensuring Niagara house residents are well cared for during his midnight shifts. 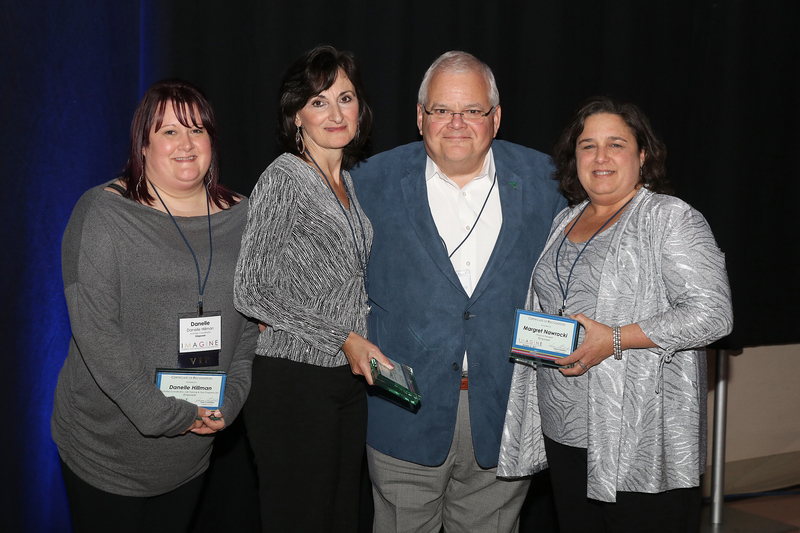 The Job Training and Day Programs division presented Jill Patterson with the Jacob Wozniak Memorial Award for her enthusiasm and dedication to ensuring the success of Empties for Empower. The Children’s Academy presented the Tommy Caserta Award to Mary Mrowka for exemplifying Empower’s values in her positive interactions with students and staff. The Children’s Academy presentedthe Family of the Year Award to Andrew Smith and Angelina Szopinski for their commitment to their son, Andrew’s education, demonstrated through their communication with his teachers on progress made at home and through their presence at every school function. This entry was posted in Uncategorized on November 6, 2017 by Elizabeth Cardamone. 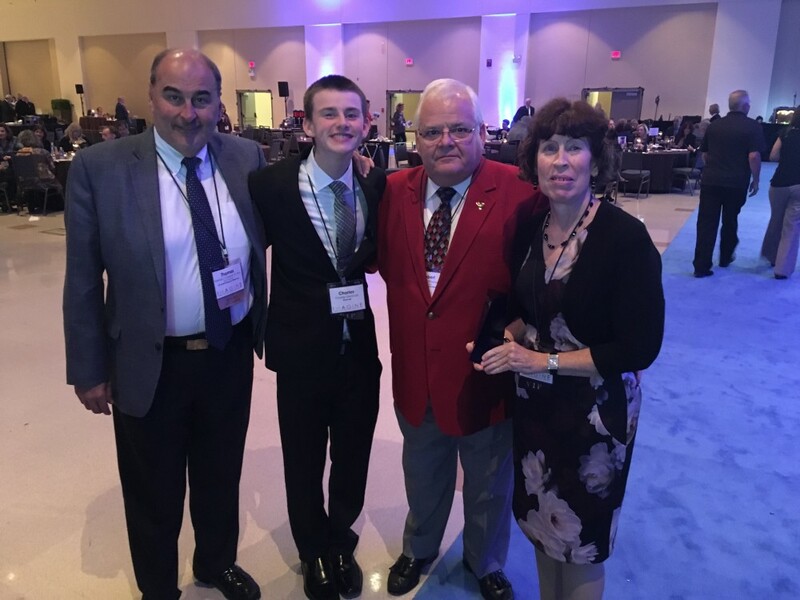 NIAGARA FALLS, N.Y., Nov. 2, 2017 – Three Niagara County residents received statewide honors at the Cerebral Palsy Associations of New York State conference on Oct. 30 in Saratoga Springs, N.Y. All three honorees were chosen from nominees across New York State. New York State Senator Robert G, Ortt of North Tonawanda received the Legislator of the Year Award. As chair of the the Mental Health and Developmental Disabilities Committee, Senator Ortt is a strong advocate for people with disabilities. In particular, he has worked to secure funding to relieve the staffing shortage in the disability field. Charles Dieteman, a student at Lewiston-Porter High School who has cerebral palsy, received the Anthony J. Koenig Volunteer Award. Beginning in sixth grade, Charles began educating his peers on cerebral palsy and showing them that there are no limits to what people with disabilities can accomplish. He has raised more than $4,000 for Empower by selling wrist bands and pizza. Mr. Dieteman previously received the Police Athletic League “Do the Right Thing” Award and Empower’s Junior Leadership Award. Kim Kiely, director of job training and day programs at Empower, received the Natalie Rogers Employee of the Year Award. Kiely is leading the effort to transform Empower’s sheltered workshops to integrated sites for people with disabilities. A Youngstown resident, she has worked for Empower for 28 years. This entry was posted in Uncategorized on November 2, 2017 by Elizabeth Cardamone.